An MSP has criticised a south of Scotland colleague who suggested the Borders should pilot plans for a minimum price per unit of alcohol. The SNP's Christine Grahame claimed that alcohol-related deaths in the area were "disproportionately higher" than other parts of the country. Lid Dem Jeremy Purvis said the claims were "grossly inaccurate and damaging". 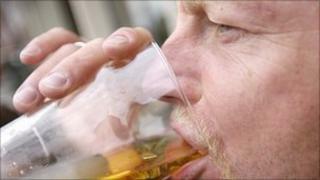 He said the Borders was actually a success story with alcohol-related death rates below the UK average. Last week the Scottish government unveiled proposals for a minimum charge of 45p for a unit of alcohol. It prompted Ms Grahame to suggest the scheme could be tried out in the Borders to "test its effectiveness". She said figures for the region between 2003-04 and 2007-08 had seen the number of alcohol-related deaths rise from 12 to 23, the sharpest increase in rates in Scotland. However, Mr Purvis said that was an "inaccurate and damaging portrayal" of the area. He highlighted the fact that figures for 2008-09 showed alcohol-related death rates for NHS Borders were just 60% of the UK average - the lowest in Scotland. The Tweeddale, Ettrick and Lauderdale MSP said there were "pockets of underage drinking" but the local NHS and council had worked hard to tackle such problems. "We actually have a success story on alcohol overall in the Borders where people are broadly responsible, consumption is way below the UK average, and morbidity levels are a fraction of those in Glasgow," he said. "Ms Grahame's comments, purportedly backed up by the government, are grossly inaccurate and damaging. "The alcohol debate is a serious one, it needs serious responses, but you start by getting facts right." Tory MSP for Roxburgh and Berwickshire, John Lamont, has also criticised Ms Grahame's proposal. "The minimum pricing proposals being put forward by the SNP government will hit responsible drinkers in the pocket and do little to tackle Scotland's serious problem with alcohol. "Moreover the potential repercussions for the Borders are that customers could choose to buy their alcohol in English towns - where the price hike will not apply - hitting already hard-pressed local retailers. "For Ms Grahame to suggest that Borderers should be used as 'guinea pigs' for these proposals is deeply irresponsible." Do you think the Borders would be a good place to pilot a minimum price per unit of alcohol? Does the region have a problem with drink-related illness? Are there other parts of the country where the move would be better targeted?